Widely recognized as America’s first professionally trained nurse, Linda Richards was born on July 27, 1841 in West Potsdam, New York. Caring for her dying mother, and then her fiancé, who was gravely wounded during the Civil War, sparked an interest in nursing, even though she had studied teaching for a year. She first worked at Boston City Hospital (now a part of the Boston Medical Center), but received very little training. After three months of being overworked, she left. In 1872, she became the first pupil enrolled in the first American Nurses’ training school. The institution was headed by Dr. Susan Dimock, and was located at the New England Hospital for Women and Children (now known as the Dimock Center). Upon her graduation in 1873, she went to New York City and became a Bellevue Hospital night supervisor. While employed there, she developed a system for maintaining individual patient records. Her system was later widely adopted in America and in the United Kingdom. 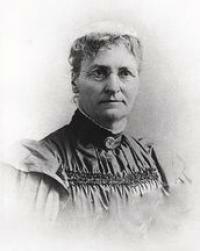 When she returned to Boston in 1874, she became the superintendent of the Boston Training School for nurses (now a part of Massachusetts General Hospital). She was able to improve the new program and keep the school from closing. It was hailed as one of the better such programs in the nation. In 1877, she went to England and underwent an intensive course of nurse training for seven months. She met with Florence Nightingale, and became a resident visitor in training at the Edinburgh Royal Infirmary, St. Thomas’s Hospital and King’s College Hospital, London. When she returned to the United States, Richards began founding and superintending of nursing training schools across the country. In 1885, she assisted in the founding of Japan’s first nurse training program. She was the supervisor at the Doshisha Hospital in Kyoto’s school until 1890. When she came back to America in 1890, she was employed as a nurse for two decades while assisting in the founding of special institutions for the mentally ill. She was elected the first president of the American Society of Superintendents of Training Schools (now known as the National League for Nursing), and headed the Philadelphia Visiting Nurses Society (now called the Visiting Nurse Association of Greater Philadelphia). Her retirement from nursing came in 1911, when she was seventy years old. She wrote a book, Reminiscences of Linda Richards, about her experiences. Richards was hospitalized with a stroke in 1923, until her death on April 16, 1930. Richards was a 1976 inductee into the American Nurses’ Association Hall of Fame.